Hey, hey, hey holiday heroes! I just wanted to let you know that your ol’ pal Doc Mock is back for a brand new LIVE show at the Upright Citizens Brigade (UCB) Theatre in Los Angeles on December 22nd! 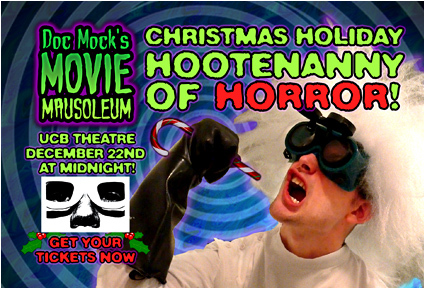 The show is called “The Doc Mock’s Movie Mausoleum Christmas Holiday Hootenanny of Horror” and we’ll be showcasing a holly jolly movie from yesteryear that will haunt your holiday memories for the rest of your life. As always, I’ll be joined by some very special guests to commentate on the movie with me along with our live audience to join in the fun. There will even be some special Christmas prizes for those of you who get on Doc Mock’s naughty list! All that entertainment for only 5 bux! Who needs The Hobbit when you can go see Doc Mock live and in person!? Hope to see you there for one ho-ho-hell of a holiday celebration!